Book cover photograph taken by me; all rights reserved. Just like most of you, I'm a magpie. I am distracted by shiny, beautiful things -- that's why I write a blog about jewelry, of course. But even more than the beauty of the pieces we discuss here, I love history, and therefore, I love a piece of jewelry with a good story. (Or a good story that involves a piece of jewelry, naturally.) 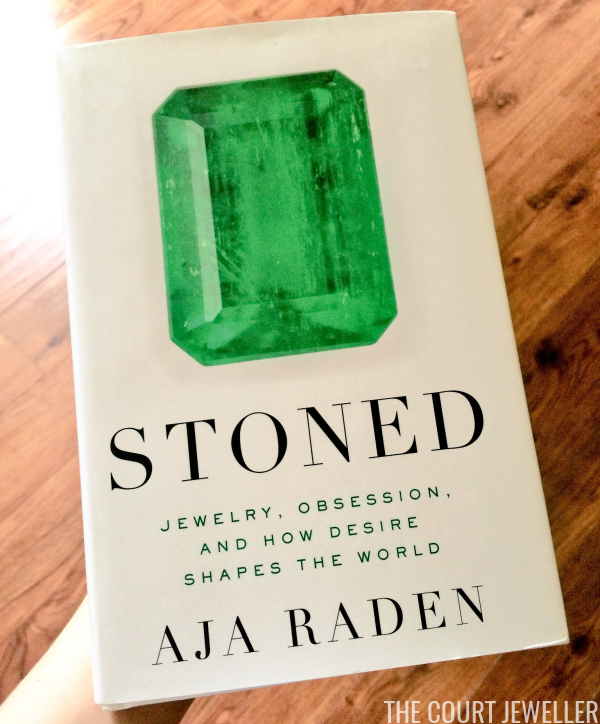 So I pretty much already knew that I was going to love Aja Raden's Stoned: Jewelry, Obsession, and How Desire Shapes the World (2015) before I even cracked the spine. Raden's book is about pretty things and the way that we see them. Why are some stones "rocks" and others "gems"? How do we decide what's valuable? Why are we so drawn to possess, collect, and wear jewelry? To get to the heart of some of these questions, Raden delves deeply into a number of important moments in the history of jewelry. From the beads that the Dutch used to buy Manhattan to the cultured pearls that helped create modern Japan, she examines the baubles that became crucial cultural, political, and historical touchstones. Even better, she uses these stories as a way to examine the very human motivations and emotions that drive our need to own, capture, and possess all of the exquisite clutter that jewelry and precious gemstones. I loved the detailed, engaging, witty histories that Raden presents around famous jewels like La Peregrina, the Romanov imperial eggs, and the necklace that sank Marie Antoinette's reputation. She's a capable storyteller, and she relates complicated narratives in a way that feels effortless and even fun. But she's also careful to look at each story through economic and psychological lenses, helping us to understand why we value, admire, and covet jewelry just as our more famous ancestors did. Raden's own experiences as a historian and as a jeweler help to give her a unique perspective on these fascinating tales, and that viewpoint makes the book even more enjoyable to read. She confidently delivers incisive critiques of the monopolies within the diamond industry or the historical exploitation of colonialism, for example, but she does so in a way that's also accessible and captivating. I wasn't bored once. I read a lot of books about royalty and about jewelry, but I can't think of one in recent memory that I've enjoyed as thoroughly as this one. If you like reading this blog, I can't help but think you'll like reading Stoned, too.